I was headed to the coast early last Friday when I heard on the radio that the area was under a tsunami warning. While a true hard-core birder might have continued on, I decided to turn around and ended up walking parts of Sauvie Island instead. This Lincoln’s Sparrow was preening in a blackberry thicket along Rentenaar Road (Birding Oregon p.57). The dark spot and line on the bird’s breast are a result of the feathers being fluffed out. This stretch of dirt road is one of the spots we will visit for my upcoming Little Brown Birds class for The Audubon Society of Portland. The Saturday field trip is full, but a few spaces remain on the Friday trip. For information, go to http://audubonportland.org/trips-classes-camps/adult/classes/lbbs2011. 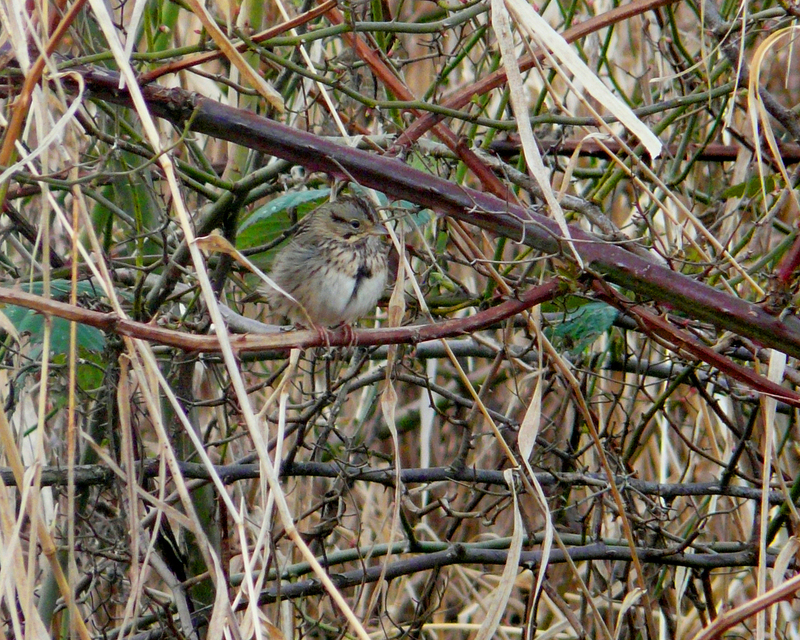 This entry was posted in OR Birding Sites, species profile and tagged Lincoln's Sparrow, Sauvie Island. Bookmark the permalink.